I have been trying to find a way to answer an unresolved “Identify the Breed” query for over a week now, but I have found the only to do it justice is to answer it is through historical analysis. So this post will identify the breed in question and then explain how this fits into retrievers. Ch. 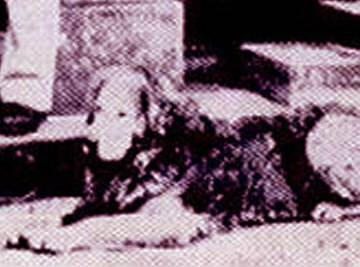 Kerry Palmerston was prominent Irish setter in the very early part of the twentieth century. Source for image. (History of Irish setters in Russia). It is not accidental that some Irish setters do look like retrievers. 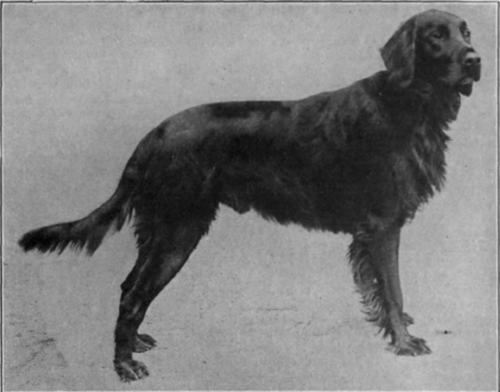 Irish setters were used to refine modern flat-coated retriever in the late nineteenth and early twentieth century. It is Irish setters of this type that were crossed in, not the very feathered Irish setters we see in the show ring. However, the setter influence on retrievers began long before these Irish setters were crossbred with flat-coats. The original wavy-coated retriever began as a synthesis between the St. John’s water dog and some kind of retrieving setter. The Large Black Retriever is known by his resemblance to the small Newfoundland, and the Irish water spaniel, or setter, between which two he is bred, and the forms of which he partakes of in nearly equal proportions, according to the cross. Hence the modern retriever is distinguished as either the curly-coated or wavy-coated, separate classes being made for them at most of our shows, and sometimes a third depending on color alone. The Wavy-coated Retriever has a head like that of a heavy setter, but with shorter ears, less clothed with hair. The body is altogether larger and heavier, the limbs stronger, the feet less compact than those of the setter, while the gait more or less resembles in its peculiarities that of the Newfoundland. The color is almost always black, with very little white; indeed, most people would reject a retriever of this kind, if accidentally of any other color. The coat is slightly wavy, but not very long or curly; and the legs are but little feathered. The night is usually about 23 or 24 inches, sometimes slightly more or less. This dog can readily be made to set and back; and he will also hunt as well as a setter, but slowly, and lasting for a short time only. –Stonehenge (John Henry Walsh), The Dogs of Great Britain. Paris and Melody were early wavy-coated retrievers, and they show the variance that existed between a strain that had both St. John's water dog and retrieving setter at its base. However, as time progressed, it was decided that the heavier built type was less efficient than the more lightly built dog. Some of the early specimens were pure and simple little Newfoundlands, and it has taken a few years’ careful work to bring the wavy retriever to what it is at the present time. Not too big but just big enough. Our grandfathers said, “Oh! we want a big retriever, a strong ‘un; one that can jump a gate with an 8lb. hare in its mouth, and gallop with one at full speed.” This is not so now. A comparatively small dog is well able to carry a hare, and shooting is so precise that puss does not run as far as she did, when properly hit. 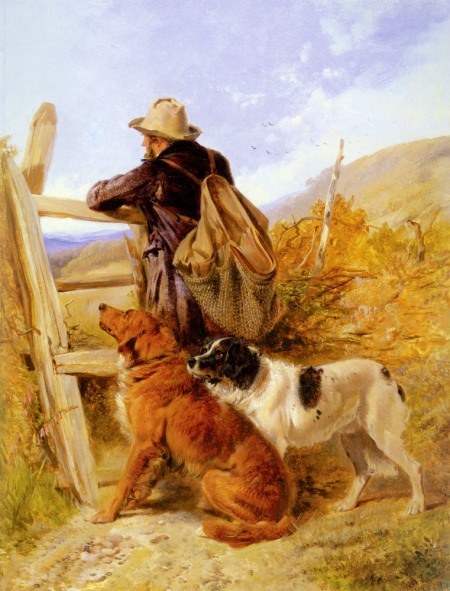 Dogs are not made to assist bad shooters to fill a bag; and a man who cannot, in ninety-nine cases out of a hundred, stop a hare before she has run seventy yards, ought not to fire at another. And you do not require to have a special dog for that one chance in a hundred. At the present time there is a tendency to produce the wavy-coated retrievers with an inclination to the type and shape of head possessed by the setters. This is, no doubt, due to the fallacy carried out in breeding for straight coats, which are all very well in their way, attractive enough in the show ring, but thoroughly bad from a workman’s point of view. During my somewhat lengthened connection with dog shows I have noticed that, as a rule, the straightest and flattest coated dogs have the greatest tendency to the longer setter-like heads. If breeding for this coat in preference to that of type of head and character is continued, mischief will be done which may not be so easy to remedy as the variety was to be produced in the first instance. I would especially recommend the judges, in dealing with this retriever, to give more credit for the correct type of head than than for an actually and perfectly flat coat, not forgetting that the dog was originally “wavy-coated” quite as much as his jacket was straight. He was a flat-coated retriever Champion, and may have been himself a good worker; but he ruined the working qualities of the descendants of Jenny above mentioned, and brought the author’s strain of them to an end. Consequently, it is suggested that the Newfoundland is the type to breed out of the flat coats. 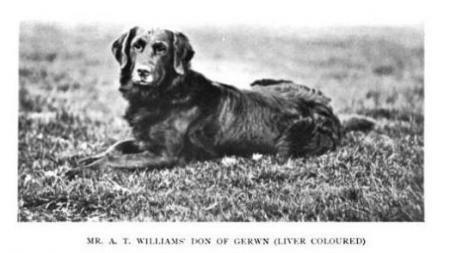 Don of Gerwn was a liver flat-coat, whose sire was a dog of Tweedmouth's strain (which is the basis of the golden retriever). He was of the type that George Teasdale-Buckell liked. And that is how the flat-coated retriever evolved from the wavy-coat, which had both setter and St. John’s water dog types in it. The golden retriever, although definitely influenced by the same forces that changed the flat-coat, held onto the heavier wavy-coated type a bit longer. I find the tendency in the golden retriever is to look at some of the early Guisachan dogs, which definitely had this type, and say that this is the only type. In reality, they were nothing more than reflection of the fact that they were early wavy-coated types. However, I highly suspect that many goldens that were registered in the foundational pedigrees were by-product of breeding Irish setters to flat-coats. Although the preferred color was always black in flat-coats, e/e reds could always be hidden as recessives. When these were born, they were faulty, but if one could register them as goldens and breed them into goldens, they would have been a definite source for both the dark color and setter ancestry. 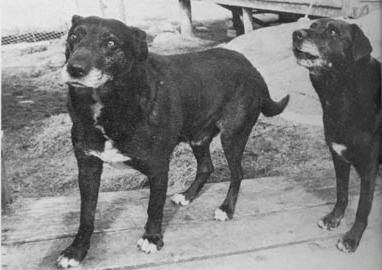 These darker colored more flat-coatish or setterish dogs were quite common in the 1920’s and 30’s and still make up the bulk of the working-line goldens in North America. I’ve noted that the early dogs in this country really resemble what we would call field-line dogs today. The working-type golden is really based upon the flat-coat that existed in the the very early part of the twentieth century. The modern flat-coat has evolved along even more setter-like lines. Additions of Irish setter blood gave the flat-coat an even more gracile frame. It also reduced the density of its undercoat, which is very different from that of a typical golden, which is still bred to be quite dense. A significant minority of flat-coats also point, a trait that is uncommon in goldens (but still pops up every once in a while). The show-type golden retriever as it exists now is actually an attempt to breed for the old-type wavy-coat. It may be one feature that has driven for a split between show and working types in the breed. This Newfoundland-type is less agile than the more lithe and wiry type we typically seen in the working bred dogs. One must remember that in British retriever trials, the dogs must retrieve where ever the bird falls. If the dog must jump a fence to get the bird, he must jump the fence. A big lumbering dog is going to have hard time jumping the fence, so trial breeders were not going to select for his conformation. Trialling mean that the flat-coated retriever would move away from the heavier-bodied type. Trialling changes the size and shape of dogs almost as easily as actual conformation showing does. 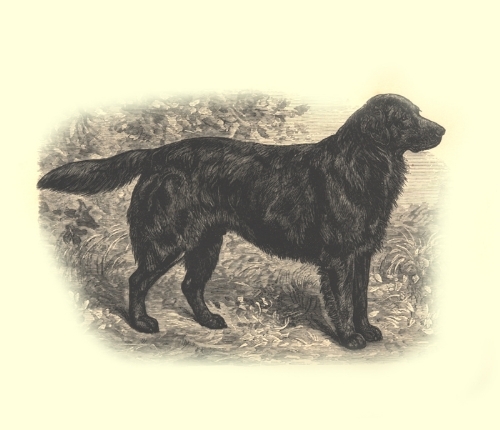 The St. John’s water dog type would simply be bred out of the flat-coat over time. However, as the golden retriever became a separate breed, the tendency was to breed for a conformation that truly distinguished it from the flat-coat. Because the original dogs at Guisachan were of the heavier old wavy-coat type, the decision was breed goldens with a bit heavier bone and better sprung ribs than the typical flat-coat. Winifred Charlesworth strongly encourages breeding for more bone in the golden in her contribution to Joselyn Lucas’s Pedigree Dog Breeding–For Profit or Pleasure. Of course, she was operating under the assumption that these dogs were derived from some kind of Russian dog, and their unique conformation did not come from the fact that the early Guisachan dogs were very typical of many of the wavy-coats that existed at that time. It was the Reverend Needham-Davies who figured out that many goldens were actually exhibiting the old Newfoundland-type wavy-coated retriever conformation. So out of a founding strain that was primarily a cross between a setter and St. John’s water dog (“Labrador” or “Newfoundland” type of dog), the dogs evolved. Trials led to the selection away from the heavier-boned type, and it was only out of the foundation of the golden retriever as a distinct breed that anyone would try to breed for that type. It has helped distinguish the show-type golden from its flat-coat cousin very clearly. One can easily tell when one is looking at modern yellow flat-coat instead of a golden retriever. However, if the two dogs had remained within the same gene pool, and the flat-coat had remained the dominant trial and show retriever in Britain, it is unlikely that the two would have diverged at all in conformation. Any goldens that retained the heavier conformation would have disappeared, just as any black flat-coats would have done the same. But as different breeds, they had to have different conformation. I am sure that similar stories exist with other breeds that have split apart in this fashion. I can show you many photos of goldens in the UK and North America that today would make nice moderate flat-coats, and I can show you others fo wavy and flat-coated retrievers– like Zelstone in this post– who had conformation very similar to the modern show-type golden. The original wavy-coated retriever existed within the Paris and Melody continuum. Breeding for trials meant that the Paris-types in the greater wavy-coat type were to become rarer. When the golden retriever became a distinct breed, one of its distinct traits became the desire to breed for a more Paris-like dog. Out of a diverse type came selection for trials and then selection for distinctiveness in both flat-coated and golden retrievers. This diversity still exists to a degree in golden retrievers, which have coalesced into working types (Melody/setterish/flat-coat-types) and show dogs (Paris/Zelstone/St. John’s water dog/Labrador/ Newfoundland types). Another source for the heavier bone in goldens is said to come from the Tweed Water dog/Tweed water spaniel. 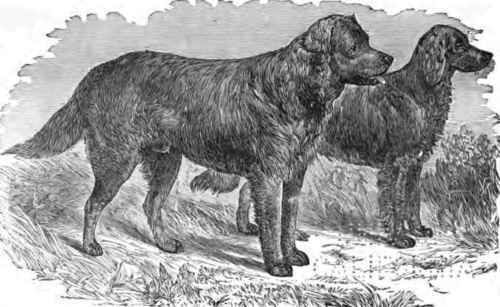 The flat-coat historian Stanley O’Neill came across a pair of reddish colored Tweed water dogs on the coast of Northumberland coast around the beginning of the twentieth centuries. The dogs were being used to net salmon, and he thought they were curly-coated retrievers. When he was informed of their breed, he was surprised to learn that they existed. He remarked that the dogs looked like heavily boned retrievers. However, I question how much influence actually came from this regional dog. It seems the main bulk of golden ancestors were within the wavy-coated retriever family. Tweed water dogs (note that I am hesitant to call them spaniels) were more like curly-coated retrievers than water spaniels. That’s because if we read Richard Lawrence’s account of them in The Complete Farrier and British Sportsman, he points out that the breed had a lot of “Newfoundland” crossed in. a variety of the Irish Water Spaniel? Hugh Dalziel’s book put them with the Irish water spaniels. Britain had tons of regional water spaniels. I think this dog was a cross between the water spaniel of Northumberland and the Scottish Borders and some form of Newfoundland. on December 27, 2010 at 11:31 am M.R.S. 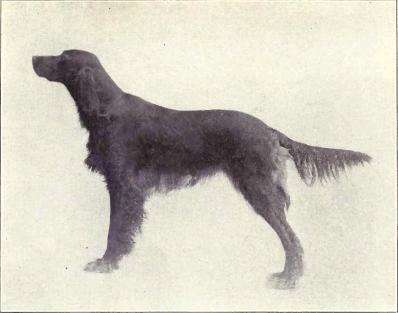 There are extant photographs of Nous (yellow wavy-coated retriever) and also photos / paintings of his offspring Crocus, Ada, and Cowslip, all from the breeding of Nous to Belle (Tweed Water Spaniel, as noted in the Guisachan record book). While Nous was a stocky dog with a heavy, quite wavy coat, his offspring were somewhat more slender in build and less wavy in coat. All were definitely golden in color (not cream, not red). Photos of other Guisachan dogs show a range of shades from light golden to dark. I do not believe there was ever any concious effort to breed heavier dogs in order to regain “old type”; it is far more likely simply that more heavily-boned dogs were deemed more attractive and likely to win in the show ring (this happens in very many breeds!). The red setter Sampson used in the Guisachan strain may or may not have been “Gordon” in origin; certainly there were many other native strains including solid color black, liver, cream, yellow. In fact, there are references in old writings that black Irish setters were fairly common. Before the Kennel Club registry, setters (like retrievers) were of numerous strains/varieties rather than separated breeds. The dark shades that were popular during the 1920s-1930s may or may not have come from a setter influence. it is just as likely, in my mind, that they came from unregistered dogs of unrecorded background, that entered the gene pool in substantial numbers before WWII; this includes Normanby Beauty, founder of the Normanby/Noranby line and who herself was of unrecorded parentage. I would not be surprised if there was a fair amount of spaniel (as in field/springer type) heritage also included. If you can find a copy of Ash’s “History and Development of the Dog” there is a photo of Mrs Charlesworth’s “golden springer” Noranby Nell…illustrating that land spaniels also came in solid red/gold. on December 27, 2010 at 12:25 pm M.R.S.